5E4631AA PART OF THIS COMPLETE LINE. APV Baker Model 250/C8, Hard candy kitchen and depositing line rated from 50 to 405 kg’s of product per hour with outputs of 500 to 2,600 pieces per minute -depending on size, materials and applicaiton. Cooking kitchen consists of express dissolver with 300 liter stainless steel mixing vessel, 450 liter stainless steel kettle with 3 blade prop style agitation. 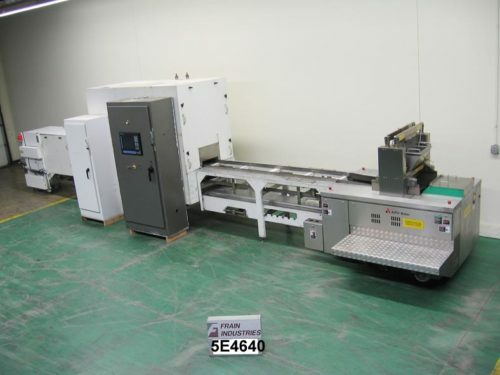 APV Baker microfilm and turbofilm cooking systems with 2 zone plate and frame heat exchangers, lobe transfer pumps, vacuum system and control panel. Bran Luebbe color / flavoring additive mixing, metering and feeding system. 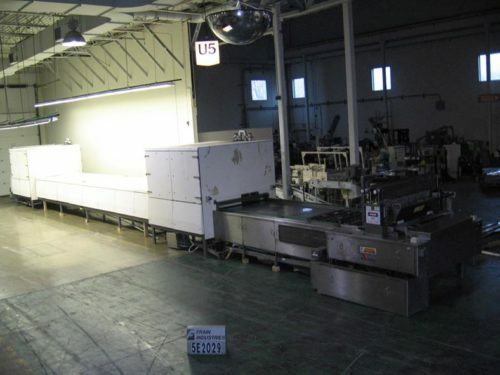 Depositing line consists of APV Baker model 250 split hopper, double row depositor with with dual split product hoppers (20) stainless steel pistons each side total of 40 per hopper capable of 10 to 65 strokes/minute at 40 pieces per stroke. APV Baker ambient cooling tunnel measuring 20′ Long x 48" Wide with control panel with A/B PLC. APV Baker Model 010372 (3) roll rotary moulder, with wire cut-off and pre-feeder, product rates – depending on materials and application. 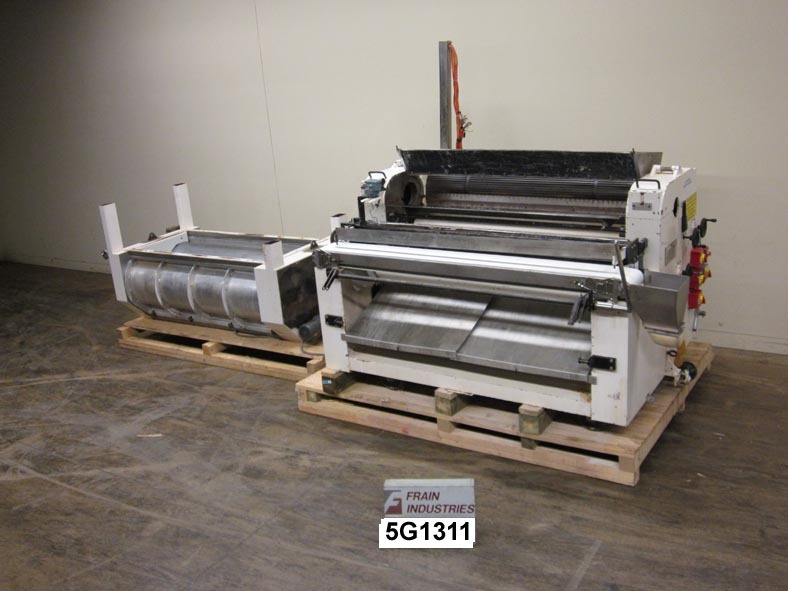 Equipped with dough pre-feeder with (2) 70" L x 20" Diameter grooved rollers and rotary moulder with top feed hopper and (1) 72" Long x 10" Diameter grooved feed roller, (1) 72" Long x 10" Diameter smooth roller for the feed belt (not included) with wire cut-off and 100" L x 9-1/2" W neopreme scrap removal conveyor. 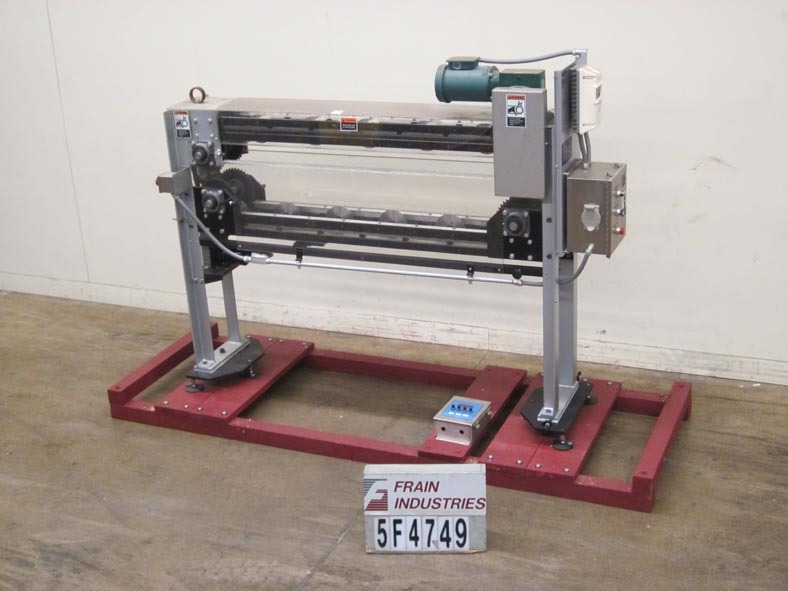 Features: Controls for feed rolls, die roll and scrape removal controls with e-stop. Automatic dough divider capable of running 20 to 190 pieces per minute. Scaling range from 12 oz to 38 oz. Low stress design with jacketed rollers for cooling. Equipped with AB plc controls and soft start drive. Last used for bread.